Collect stamps with every purchase over £3. Get started with some: one if you sign up online and three if you sign up on the app (which is enough for a free side, FYI). What could possibly be better than free chicken? 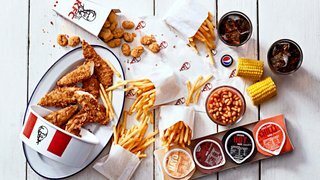 Sign up to the Colonel's Club and youll be able to get your hands on free food and drink, plus exclusive offers from KFC. I understand that I will receive only one portion of 2 FREE Hot Wings® per order. Click here!